A festival this weekend celebrates the arrival of a Buddhist relic at a temple in rural Dakota County. After a trip to India in February, Cambodian Buddhist monk Sang Moeng returned to Watt Munisotaram, his home temple near Hampton, Minn., practically bubbling over with excitement. 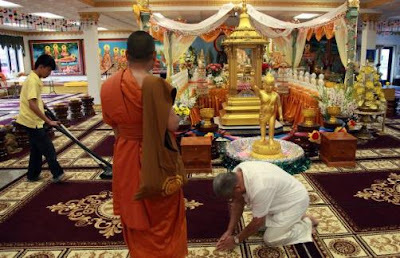 The Maha Bodhi Society of India, a group that oversees many Buddhist shrines, including the Tree of Enlightenment, offered to help find a relic of Buddha -- remains believed to be perfect proof of enlightenment, and symbols of wisdom, love and compassion -- for the rural Dakota County temple. This weekend, Watt Munisotaram hosts a festival to celebrate the arrival of the relic from another temple in Colombo, Sri Lanka. "We were fortunate to find a temple willing to share a relic with us," Yanat Chhith, a leader of Minnesota's Cambodian Buddhist community, said. "It's a very small piece, but that's good enough." As many as 2,000 people from around the country and world, including monks from as far away as Sri Lanka and Bangladesh, are expected to participate in ceremonies this weekend as the relic of Buddha is enshrined in the temple, located among nondescript farm fields a few miles east of Farmington. They will also be celebrating the 21st anniversary of the Minnesota Cambodian Buddhist Society, the groundbreaking for a building called a stupa that will eventually house the relic, and a flower festival to raise funds for construction. The celebrations runs through Sunday and the general public, Buddhist and otherwise, is invited to participate. "Our world is so divided, but here we're all working together," Chanda Sour, a temple board member, said. Trying to convey the spiritual significance of the relic, Sour and the others said words failed them. "A lot of this is too deep for words," Sour said. Just preparing for the festival has drawn dozens of volunteers to clean, cut grass, prepare food and decorate the temple. There are between 7,000 and 8,000 Cambodian Buddhist in Minnesota.